can you add CLICK option to “select open mode” (Press, Click, Hold, Double Click, Tweak) ? Yes, but why and where you prefer to use CLICK instead of PRESS? L.operator("pme.exec", text=slot, icon=icon, icon_value=icon_value, depress=C.tool_settings.mesh_select_mode).cmd = "C.tool_settings.mesh_select_mode = (True, False, False)"
L.operator("pme.exec", text=slot, icon=icon, icon_value=icon_value, depress=C.tool_settings.mesh_select_mode).cmd = "C.tool_settings.mesh_select_mode = (False, True, False)"
Yes, but for ‘DRAW’ not ‘CALL’ menu. like the ‘expand popup dialog’, but for blender standard menus. Yes, I understand. But why you need that release event? 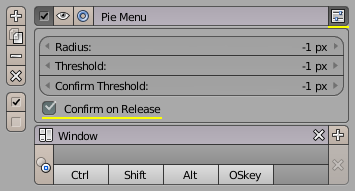 PME has Confirm on Release option for pie menus. Have you tried to turn it off? How to copy menu class name to the clipboard. ‘confirm on release’ don’t to give me what I need, but ok, I’ll implement tweak using pme editor. Blender 2.8 crashes when I try to launch my custom pie menu when I am in full screen mode. i’m using v 1.15.14. Is it a bug? I use custom shortkey CTRL+right click. Love the pie menu editor! Unfortunately this example wont work. Does anyone know a better way of reaching %appdata% without statically typing out the path? Hi, please export and send me the pie. I’m looking to have property drop down for what image the ‘image texture’ node uses in the node editor. Is this possible? I’m in 2.8 btw. 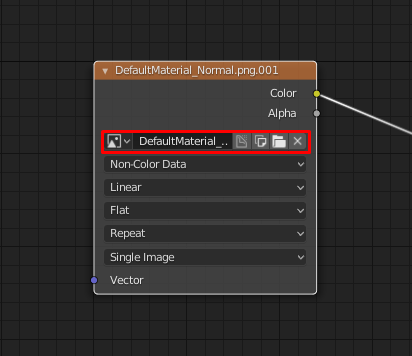 Also when I use “panel(‘EEVEE_MATERIAL_PT_context_material’, frame=True, header=True, expand=None, area=‘PROPERTIES’)” in a popup dialog the ‘New’ Button creates a material but does not assign it to the object, which differs from how the default panel works. Hi, I’m trying to move to version 2.8, and many things don’t work. This is feature 2.8 or pme can’t reproduce settings from version 2.79? For vertex/edge/face use mouse wheel and ctrl for expend, shift for extend, but cant reproduce it in 2.8. Trying to add pivot points(median/individual and etc) to pie menu and they can’t be added. Use macro for lasso select and occlude geometry for rmb and drag but its dont work in 2.8. Cant reproduce macros with lasso select, similar how you show in tutorial for dissolve vertex, or lasso can be used only on lmb? Yes, this feature would definitely be a great addition. I had a chance to work with Nvil/ Voidworld. Its amazing how simple the moving along axis using “smart” way can be. Just press a button and it snaps to the axis in the direction you move the mouse/pen. Since moving, rotating and scaling are the most frequently used actions there is a huge potential in time-saving and “smart” modelling. @roaoao By the way thanks for the Pie Menu Editor addon. Its amazing tool!!! Yep, unfortunately some panels/widgets are not designed for popups. Hi, I’m trying to move to version 2.8, and many things don’t work. This is feature 2.8 or pme can’t reproduce settings from version 2.79? For vertex/edge/face use mouse wheel and ctrl for expend, shift for extend, but cant reproduce it in 2.8. Trying to add pivot points(median/individual and etc) to pie menu and they can’t be added. PME uses same settings for both Blender 2.79 and 2.80. Check Python API changes. Cant reproduce macros with lasso select, similar how you show in tutorial for dissolve vertex, or lasso can be used only on lmb? Yes, this is a good feature and I think it can be implemented as an add-on. Can you show me some usage example? On youtube for example.